Dr. William A. Gruver has a distinguished international record of accomplishments in the research and practice of robotics and intelligent manufacturing systems within North America and Europe. 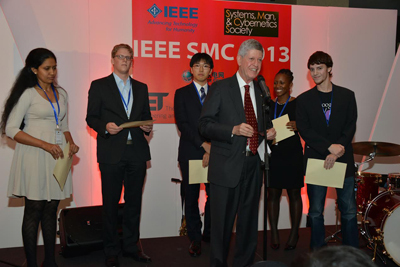 The IEEE Board of Directors elevated SMC Senior Members to the grade of Fellow. Please join us in congratulating the following colleagues who were evaluated by the SMC Society. In 2014, IEEE will mark its 50th Fellow Class. It represents decades of honoring IEEE Fellows whose extraordinary accomplishments have changed the world. The IEEE grade of Fellow was born in 1964 out of the merge of the American Institute of Electrical Engineers (AIEE) and the Institute of Radio Engineers (IRE). The emphasis on the elevation was and still is reserved for select IEEE members who have contributed importantly to the advancement of engineering, science, and technology, bringing the realization of significant value to society. New to the Fellow Web Site is the redesigned Fellows Directory. It is the most comprehensive online search and networking tool available to members. If you need to complete an IEEE Fellow Nomination, gather information for a region, section, or society, it's now easy to accomplish. Honours for Keith Hipel, FCAE, FRSC. On behalf of the senior leadership of IEEE SMC Society, the Newsletter extends hearty congratulations to our new senior members elevated in 2013. 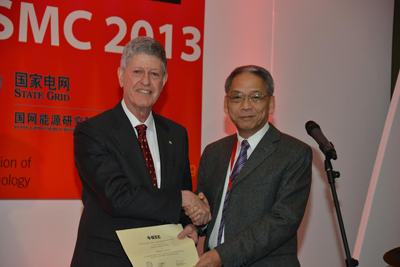 The best student paper award at SMC2013 went to Ken Amai from Osaka University. The title of the winning paper is: "Effective Combination of Search Policy based on Probability and Entropy for Heterogeneous Mobile Sensors." Dr. Gruver is shown introducing the winner at the Manchester SMC Conference.